Information on how to download, install and activate KnitBird. The file that you download is an Adobe AIR Package which you cannot install unless you have Adobe AIR installed first. Adobe AIR is a software platform which enables KnitBird to run on both Windows computers and MacOS computers. Click here to get Adobe AIR and set it up. In some cases, your computer might try to open the downloaded KnitBird package as a zip file. If that happens, try to make sure that the file name is KnitBird.air but not KnitBird.zip. Also, try right-clicking the file and select Install. If Adobe AIR is installed, you should be able to open the downloaded KnitBird package and install it. After that, KnitBird will be installed on you computer. After you have installed KnitBird, you’ll want to activate it if you have purchased it. Click here for information on how to activate. We have had cases where people have some problem downloading KnitBird. Please contact us if you are experiencing that so we can assist you. 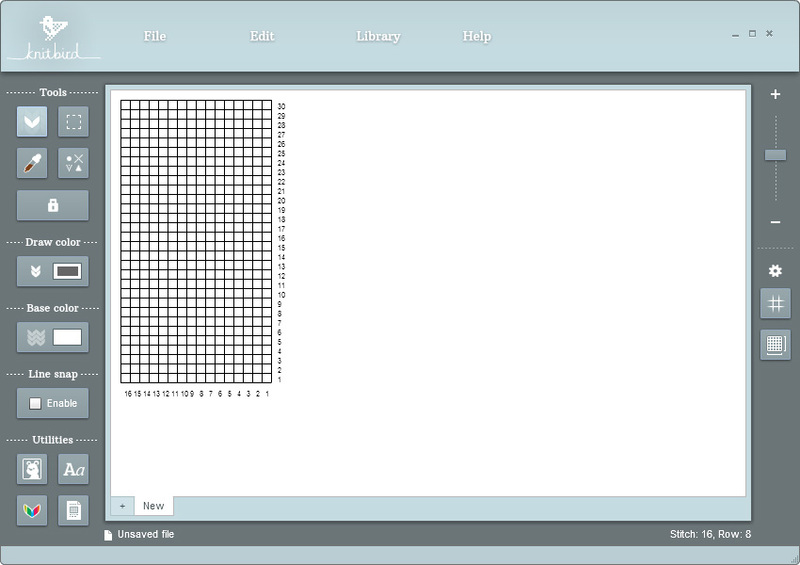 KnitBird can be downloaded as a trial version. Once a product key has been purchased it can be activated to a full version. When you open KnitBird for the first time, you will see an orange banner on top of the application window. To activate, click the “Click here to register using your prouct key” link. A window will appear. Type in your product key in the form of xxxxxxxx-xxxxx-xxxxxx (eight letters – five numbers – six letters). Optionally you can type in your name and your email. This is not obligatory but can help us to find your product key in case it gets lost. Here is a short guide on how to get started using KnitBird. 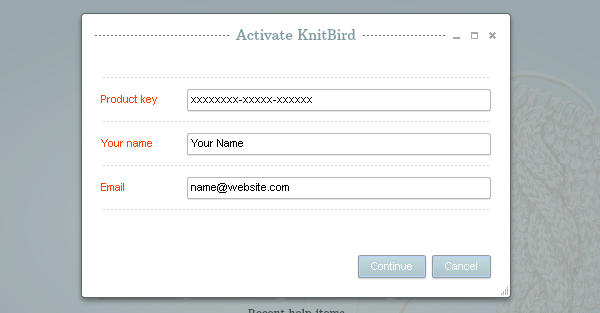 If you have purchased KnitBird, click here for information on how to activate it. When you open the applications, this screen welcomes you. 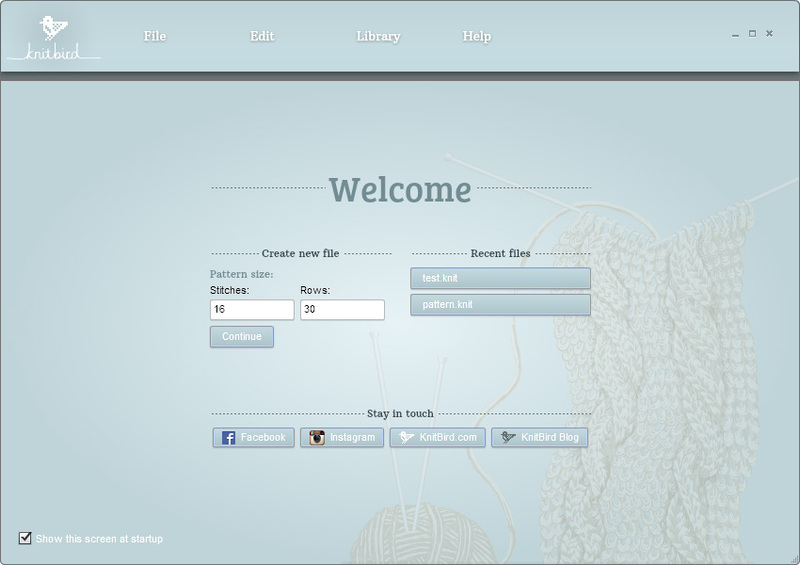 From here you can create a new file, open recently created and opened files or visit KnitBird on the web. 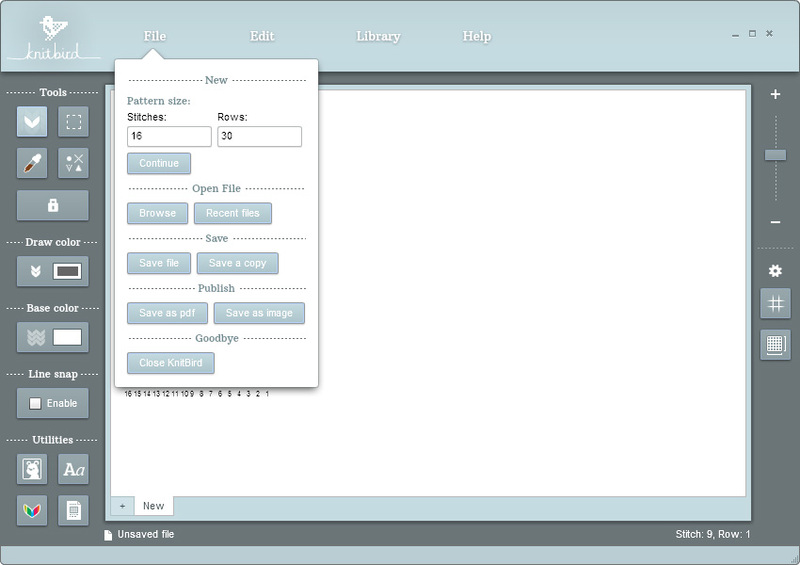 To create an empty file, you can click on “File” on the main menu or create it from the Startup Screen. The image below shows an empty file which is ready to be drawn on. The main menu is on top of the application window. From there you can create new files, open and save files, export images, copy, paste and undo previous actions. You can also change the language of the application which is available both in English and Icelandic. All the tools you need are located on the left side of the application window. On the top there are the basic tools for drawing, symbols, selection and a color picker. Next there are tools for select drawing color and base color of your chart. Below the color selections you have tools to creating straight and dashed lines and tools for inserting images and text into your chart, changing colors and for editing written instructions for your published chart. Read more on how to draw.